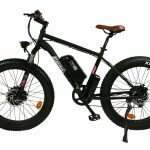 Fat Tyre Electric Mountain Bike, Double 36v Batteries, Front Fork MOZO Suspension, Midnight Eclipse Matte Black, Aluminium frame, Shimano groupset, 250-watt electric motor. In the burgeoning world of electric bikes, our Atomic Bomber is the beefy, pumped up equivalent of the monster truck. 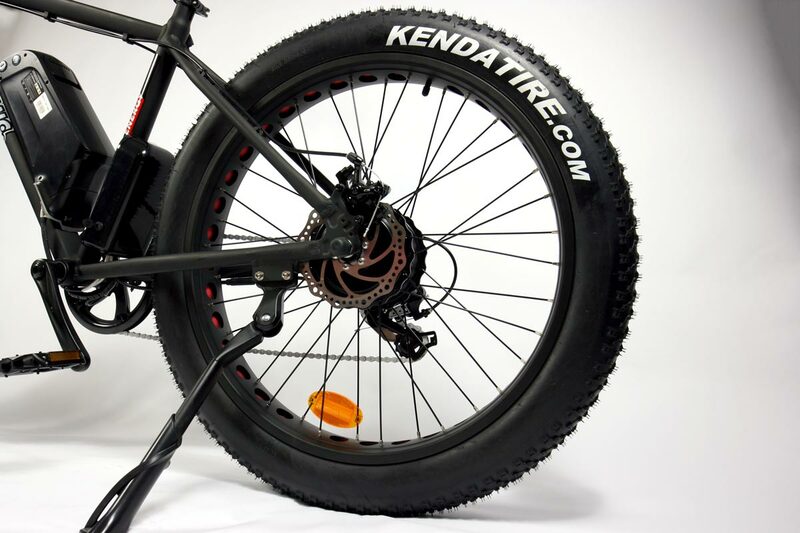 If mud bogging and truck pulling, tickles your fancy, then our ‘fat bike’ will really push your badass buttons. 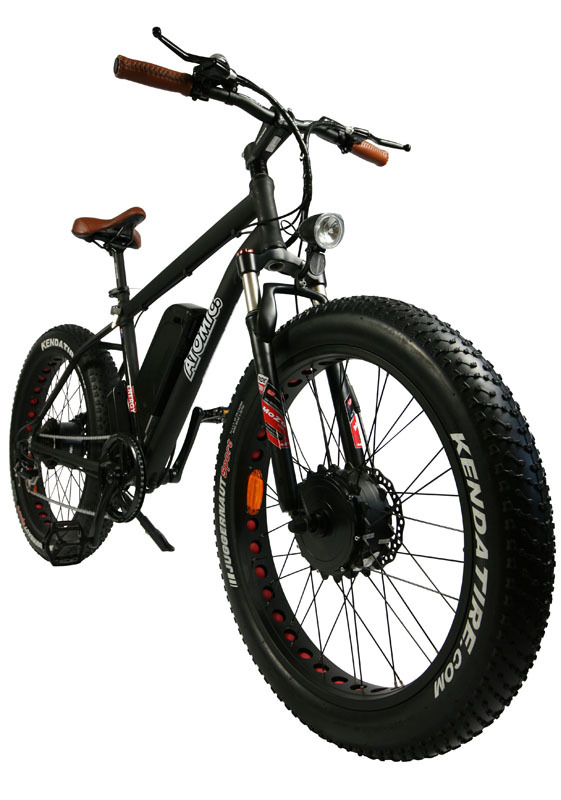 So named because of its oversized tyres, the fat electric bike is a beast that allows you to have some extreme fun in a whole variety of terrains, like snow, sand and rough trails. But the great thing is that even if you don’t plan on leaving the urban jungle, you’ll just as easily be able to navigate kerbs, steps and any other steel or concrete obstacle the city wants to put in your way. 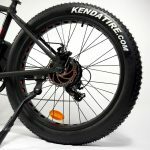 The Atomic Bomber’s massive Kenda 4 inch tyres are designed to hold larger volumes of air, so you can get away with lower pressure, meaning they’ll conform to anything they roll across. 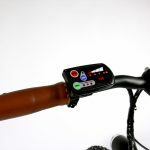 So as well as your electric assistance, the fat electric bike takes you places that no ordinary bike would dare to venture. 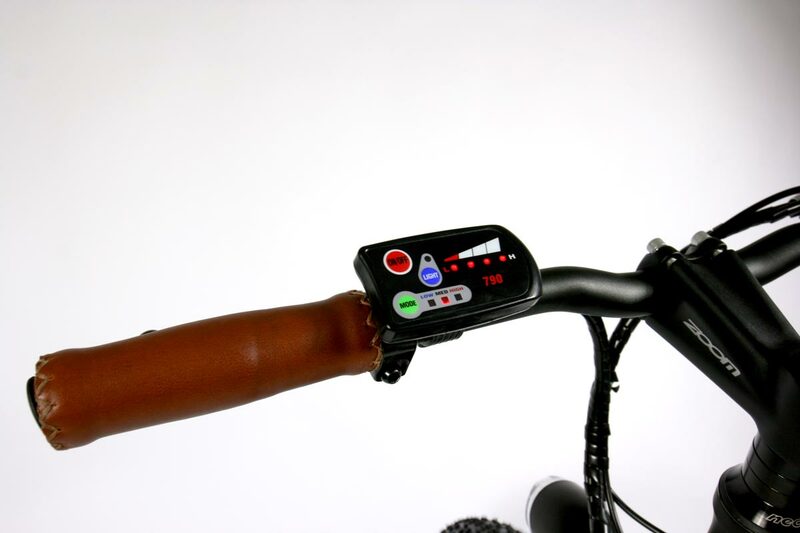 You can ride with ease on all kinds of sand, making this bike a perfect companion for surfing and beach enthusiasts – or river hiking and fishing expeditions. And if you’re seeking snow…well that’s cool, because you can load up your snowboard and rest assured that the Atomic Bomber can tackle that too. 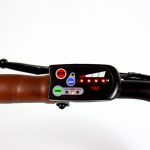 The Atomic Bomber electric bicycle has double 36 volt batteries that will provide you with a mammoth 130 to 150 kilometres of non-stop monster biking action. 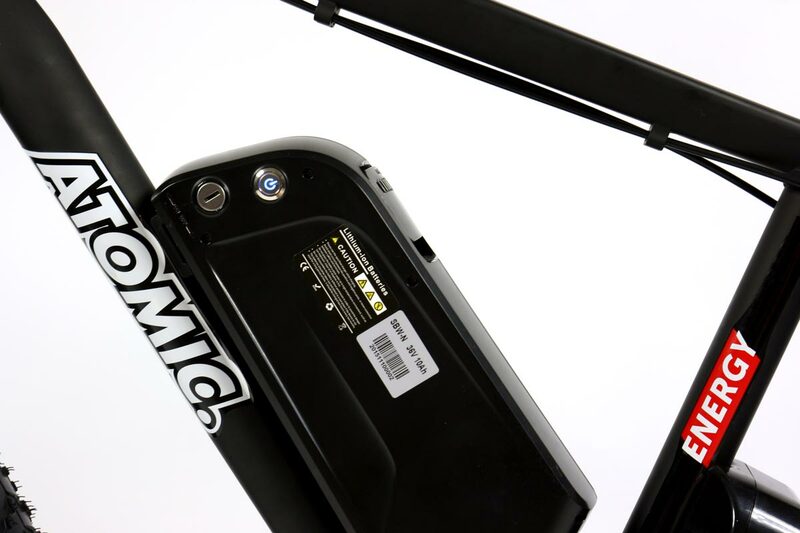 Forget about running out of juice…simply switch between one and the other with the press of a button and you can almost triple the amount of staying power of a single battery. 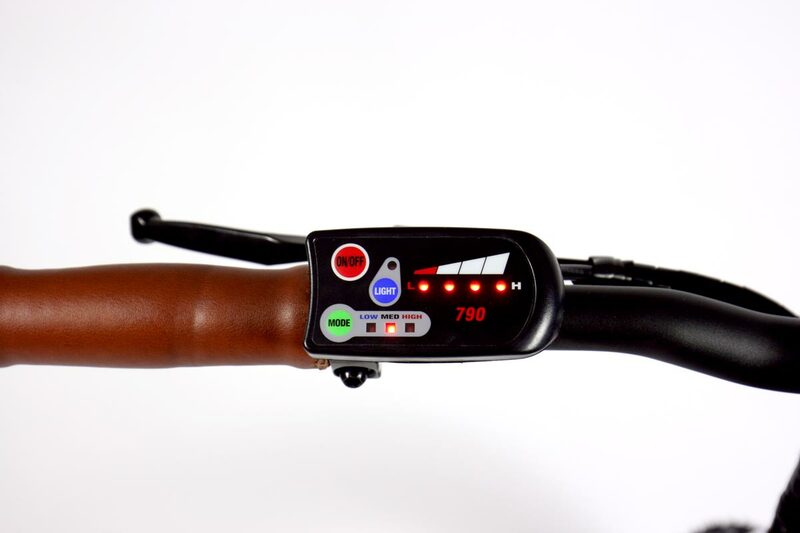 With 6-8 hours charging time the efficiency and convenience of this e-bike’s battery power doesn’t get much better. 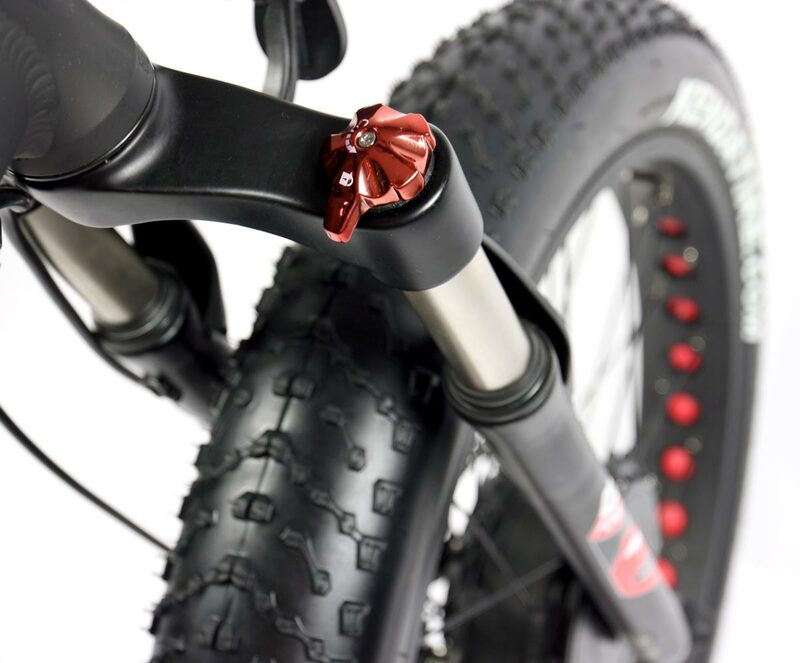 The Bomber has front and back mechanical ventilated disc brakes for ultimate safety and ease of operation over rough and uneven surfaces. It may not be able to trample a truck, but for a two wheeler, this beast can wipe out all the effort of navigating tough topography. Powered by a rear-hub 250 watt brushless geared motor and in keeping with its monster persona, it can handle a load capacity of up to a hefty 120 kgs. 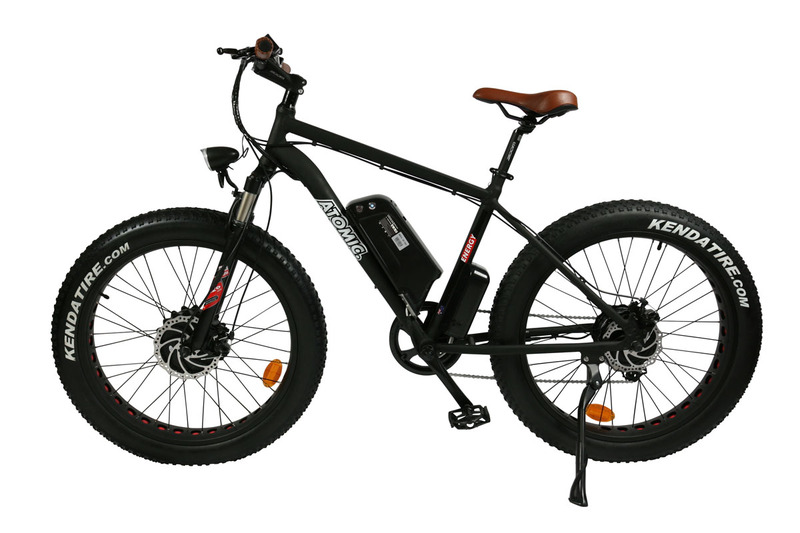 When it comes to quality and performance, this bike is tough, built for punishment, and carries top notch electric bike components by Shimano, including outer 6-speed derailleur. Aside from the tough exterior, the Bomber, the grips and seat are built for comfort, in attractive tan leather. 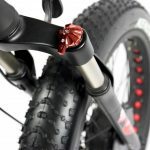 Clearly the Atomic Bomber throws down the gauntlet when meeting the challenge of two wheeled all-terrain power at a surprisingly affordable price. Its handsome Midnight Eclipse matte black finish gives this bike an almost legendary persona. 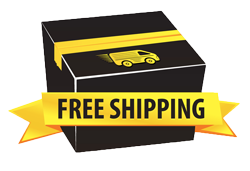 You are eligible for our FREE Delivery. Join now or sign-in below for a faster shopping experience. Activate your discounts instantly! Join now, there are great rewards. It takes only a few moments and it is, obviously, free. Login now to instantly activate your discounts. Got a question about this item? Go ahead, ask us anything!